MainAll NewsMiddle EastPompeo to Khamenei: What have you done for Palestinians? Pompeo to Khamenei: What have you done for Palestinians? Secretary of State points out Iran's hypocrisy vis-a-vis the Palestinian Arabs. 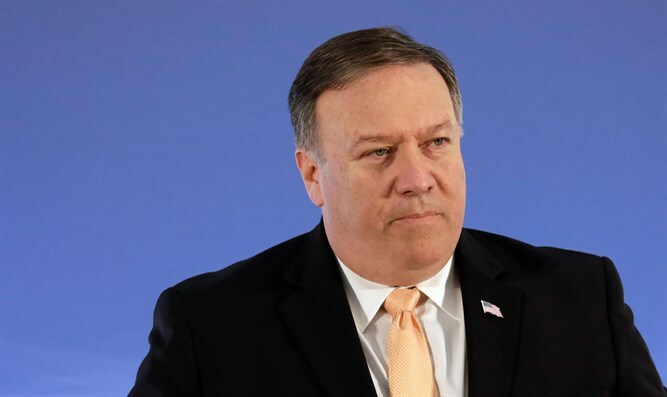 US Secretary of State Mike Pompeo responded to Iranian Supreme Leader Ayatollah Ali Khamenei, after Khamenei implied on Twitter that Palestinian Arabs should not be neglected. Pompeo published a series of tweets in which he pointed out how little Iran has done over the years to support Palestinian Arabs. “Ayatollah Khamenei says he cares about Palestinians. FACT: Since 1994, the U.S. provided $6.3 billion in aid to support the Palestinian people; Iran’s morally corrupt regime provided hundreds of millions in aid to terrorists who endanger the Palestinians’ lives & livelihoods,” he wrote. “FACT: Iran’s regime punished Palestinians by providing them just $20,000 — yes, $20,000 — via UNWRA from 2008 to 2017,” continued Pompeo in a second tweet. “If only the Ayatollah’s regime didn’t ban social media in Iran, maybe the Iranian people would know the truth about who really cares about Palestinians, and why the regime wastes the people’s money on terrorists while they struggle,” he concluded. Iran has enjoyed close relations with Hamas, though relations soured several years ago when Hamas refused to support Syrian President Bashar Al-Assad, a close ally of Iran's, in the uprising against him. An angry Iran then reportedly stopped supplying the terror group with weapons. Last year, however, Hamas leader Ismail Haniyeh thanked Iran for its "unlimited" support for the Al-Qassam Brigades and its contribution to the development of Hamas's military capabilities, an indication that the rift was over. Later that year, deputy Hamas leader Salah al-Aruri led a high-ranking delegation to Tehran, where he declared that Hamas and Iran have agreed to set aside their past differences. Jason Greenblatt, President Donald Trump's Special Representative for International Negotiations, has in the past also pointed out the fact that Iran sends funds to Hamas, which it uses to develop weapons and build tunnels to attack Israel.